Success for Club gymnasts' in recent Competition. Read the results here. Recent Ladywell Bear in Indonesia update. Great photos' can be viewed here. Results from the Club's success at the Pegasus Open Competition available here. Results from the Club's successful visit to a Competition in Malta available here. Ladywell Bear and Amy Ennis visit Nepal. Great photos' can be viewed here. Club Annual Championships a fantastic success. Results here. Club Fundraising Team raise £889 bag-packing at Savacentre. Amazing effort ! LGC girls show 'Diversity' in winning London Youth Games. Full article here! Recently, nine gymnasts' from the Club took part in a Workshop sponsored by British Gymnastics aimed at providing these young people with their Helpers and Officiating Awards'. One element of the qualification process was to organise and execute a successful Fundraising Event. One of the Teams, consisting of four of the girls involved in the Workshop organised a 'Sponsored Sleepover' which had the 'Gladiators' as its theme. The girls requested the Club's permission to hold the event at their premises and it was decided to dedicate the event as a fundraiser. The event was a spectacular success and Anna, Charlotte, Sydeny and Sophie excelled with their dedication, organisational skills, control of the event and their ability to ensure that everyone who attended had a fun time. The event raised a fantastic £555.61 - which was donated to the local Jimmy Mizen Foundation; a charity established by the Mizen family after their son Jimmy was tragically killed in May 2008. 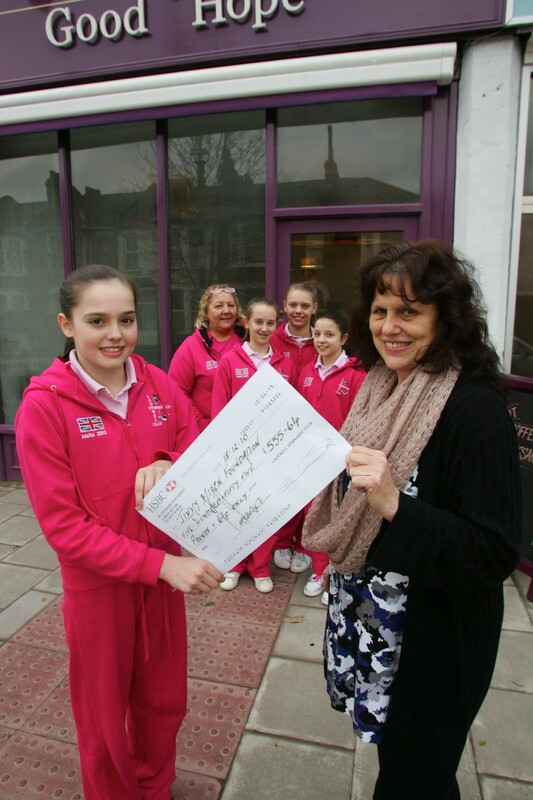 Below is a photograph of the girls' accompanied by Club Head Coach Shirley handing the money to Mrs Margaret Mizen, Jimmy's mother outside their Coffee Shop in Lee - appropriately named The Cafe of Good Hope.